This hearty chili proves that you don’t have to go without your favorite dishes on a low-FODMAP diet. This chili is nothing but delicious; it isn't missing a thing. Canned lentils are the star ingredient here because they're lower in FODMAPs than lentils you boil from scratch because some of the FODMAPs will have passed into the canning water and can be drained away. In an extra- large (12-inch) skillet, heat garlic-infused oil on the medium high heat. Add bell peppers and sauté until softened, 3 minutes. Move the peppers to the side of the pan and add the ground beef. Fry beef, crumbling and stirring until browned and no longer pink, about 4 minutes. Combine meat with red peppers and stir in scallions, ground chiles, cumin, oregano, salt, and pepper. Add tomatoes and their juices, tomato paste, lentils, and water, and stir until tomato paste dissolves. Lower the heat and simmer for 15 minutes. 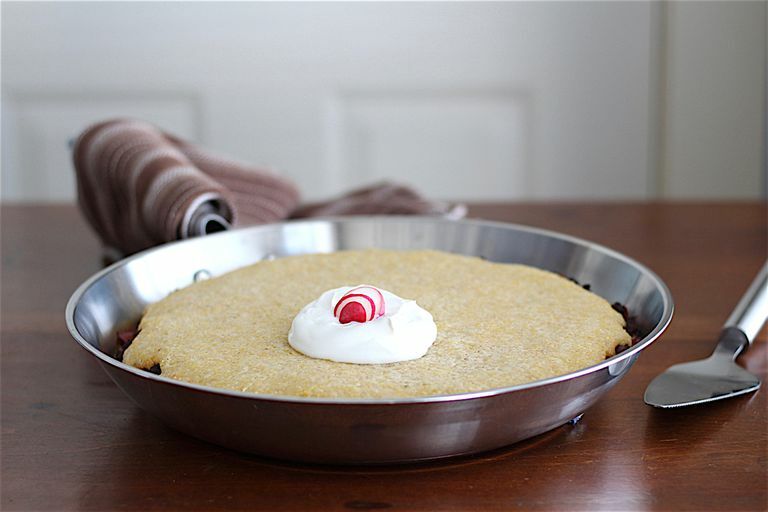 If you won't be baking the cornbread in the skillet, carefully transfer chili to a greased 2 ½-quart baking dish. While the chili is simmering, in a medium bowl combine cornmeal, sorghum flour, tapioca starch, sugar, baking powder, and salt. Add the egg, milk, and oil to the dry ingredients and mix until smooth. Stir in the cheddar cheese. The batter should be thick but slightly loose and almost pourable. If it's too thick, add additional milk 1-2 tablespoons at a time. Spoon dollops of batter evenly over the top of chili and spread with back of the spoon almost to the edges, leaving a small border; the batter will spread out as it cooks. Bake until the cornbread is golden brown and a toothpick comes out clean when inserted in the center, 18-25 minutes. Remove skillet from the oven; don't forget, the handle will be hot! Allow the dish to cool for 5 minutes, then cut into 8 wedges; serve with a dollop of lactose-free sour cream and sliced radish. Ground turkey can be used instead of ground beef. In a hurry? Skip the cornbread topping and enjoy your chili with rice, quinoa, corn tortillas, or tortilla chips. You will need a large 11 to 12-inch oven-proof skillet to take this recipe from the stovetop to the oven. If you don’t have one, the chili can be made in a skillet and transferred to a 2 ½ to 3 ½ quart baking dish for baking the cornbread. The type of cornmeal used affects the texture and cooking time of recipes. It is a good idea to use the exact type of cornmeal that the recipe calls for. For example, this recipe calls for medium grind cornmeal. If you use stoneground cornmeal, with coarser, bigger particles, you can expect that a longer cooking time will be needed. Note that tapioca starch and tapioca flour are the same things.